When you become a member, you receive unparalleled access to explore the Museum while also nurturing your creativity and playing an important role in supporting Boise’s oldest visual arts organization. Join today and receive 12 months of free access to exhibitions, special member receptions, programs and events, and much more! With your support, we can continue to provide the visual arts programs that make BAM a cultural jewel in our community. To learn more contact Rebecca Mulberry, Membership Coordinator, at 208-345-8330 ext. 115 or by e-mail. At the Dual/Family level ($60) and above, all dependants ages 17 and under living in the residence receive their own membership cards, which are stamped when cardholders visit the Museum. A child who collects six stamps may redeem his or her Kid and Teen Card for $5 worth of BAM Store merchandise. Each child also receives a BAM Mascot sticker and an art project to complete at home. Teens receive information about upcoming programs and Teen nights. (Grandchildren listed on a Family Plus membership do not receive Kid or Teen Cards). Members at the Contributing level ($250) and above also receive a reciprocal membership with the Sun Valley Center for the Arts in Sun Valley, Idaho. Benefits include discounts and advance purchases on classes and events at the Sun Valley Center for the Arts. Convenient option for BAM members! Save time and simplify your life by having your BAM membership automatically renewed every year. When you enroll in auto-renew, BAM will automatically bill your credit or debit card on file when your membership is due for renewal. Before any payment is billed, you will receive an email notification to alert you that your BAM membership will be automatically renewed for another year. You will then be charged the due amount at your current membership level. You may opt out of automatic renewal at any time. Select auto-renew when you join BAM or renew your BAM membership online. BAM offers a unique opportunity to support the Museum’s Permanent Collection while gaining insight into the visual arts with like-minded individuals. Members learn about the ever-changing world of art, meet new friends, and have the opportunity to travel on BAM art trips accompanied by BAM’s Executive Director. BAM members at the Advocate level ($125) and above are eligible to join Collectors Forum (CF). BAM now offers three membership options–Contemporary Art Circle, Northwest Art Circle, and American Art Circle–each of which supports BAM’s Permanent Collection in a unique way. Annual dues range from $400-$800 for individuals and $800-$1600 for couples. Details» Dues directly support BAM’s Permanent Collection and CF programs/events. Members gather for exclusive programs each year, from artist lectures to exhibition previews, as well as an annual holiday party. Support what you love, while having fun, learning, and building a unique community asset! If you are interested in joining, please contact BAM’s Membership Coordinator, Rebecca Mulberry, at 208-345-8330 ext. 115. 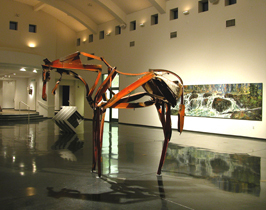 IMAGE: Deborah Butterfield, Democrat, 1995, found steel. Purchased in 1997 with CF Acquisition Funds, BAM Acquisition Funds, and Private Donations. Are you a Boise Art Museum Affiliate? Surprise your friends and family with the gift of art! A BAM Gift Membership is a unique gift for any occasion, and it lasts all year long. Choose your desired gift level and click “Join Now.” When prompted, select the “This is a gift for someone” option. Boise Art Museum may deny membership for any reason including but not limited to disruptive behavior, harassment, threats, misconduct or ill will toward the Museum, its employees or volunteers or a lack of support for the direction, purpose or mission of the organization. • Age 35 and younger (including college students). Nothing is mailed. • All core member benefits for 2 adults and grandchildren ages 17 and under. Grandparents must accompany children at the Museum. New U.S. Citizens are invited to join BAM with a FREE one-year membership within one year of becoming a naturalized U.S. Citizen in Idaho. Present your certificate of naturalization to BAM Store staff to receive a complimentary BAM Family/Dual membership for one year.